How many times have you been told your brilliant idea was foolish? How often are your child’s creative ideas disregarded at school? How often is an innovative idea ignored by those in power? I attended a play last week about Buckminster Fuller, the genius who created many structures based on the geodesic dome. He was a man with fascinating ideas, including the idea that humanity would someday use renewable sources of energy, such as wind and solar power, and the idea that we have the technology to feed all people on the planet. Does this sound familiar? He was a man dedicated to discovering what one individual could do to help humanity. He died in 1983. I’ve always been drawn to Fuller although I don’t understand many of his theories, but like many geniuses he lived out his passion without succumbing to the pressures of being “normal.” He also taught at Black Mountain College, near where I live, where the innovative choreographer Merce Cunningham spent some summers. They both had a passion related to the use of space. 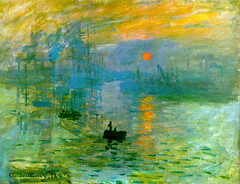 Monet, the Impressionist painter, was full of passion like Fuller. Nothing could stop him. Despite poverty, war, and the lost of his wife, his soulmate, he continued to paint, even in the bitter cold of winter, no matter how many times his paintings were rejected. And because of that we now can experience the joy of viewing his paintings where light and shadow play in ways no painter before him had ever captured. So what really constitutes genius? Fuller also said, “I’m not a genius. I’m just a tremendous bundle of experience.” There’s no doubt that experience makes it possible for us to understand and create more because we develop more skills. But I think what constitutes a genius is one who has a vision and follows it relentlessly. That passion to discover and understand pushes us beyond the normal limits of human curiosity, and it is there, beyond reality, that we discover what no one has seen before. After seeing Fuller’s story, I was left with this thought. How many of the young geniuses in our schools are we losing? Does anyone notice the quiet kid doodling in the back of the room when we celebrate athleticism and extraversion above all else? Do We Encourage the Geniuses in Our Schools? For several years, I taught gifted high school students in the New Orleans Public Schools. These students had IQ’s of 130 and above. I also taught in a small town in New Mexico and in other school systems there. I substituted in North Carolina schools as well. What I observed in these schools in contrast to what I saw in the private schools where I had taught in my early teaching years was shocking. Fuller believed that all children were born brilliant, but that education and society destroyed their creativity. I’m afraid I tend to agree. We are obsessed with conformity and were particularly obsessed with it in the 1950s when I was growing up. I was told many times that the creative things I wanted to do were inappropriate for me. I was supposed to get married and have kids, not have a career, not design dresses or become a doctor. Although I hope we are past the sexist attitudes of an earlier time, I feel that extremely intelligent and “nerdy” kids are facing a huge challenge. They are often the ones who are bullied. They are often ignored or their unusual ideas are laughed at. They are often not socially at ease. But they are also the ones like Steve Wozniak who may create the technology we need to save the planet. We are facing a critical point in our development as a human race. We need everyone’s creative ideas to solve the problems that face us, and our educational system and attitudes need to change to respect those with innovative and unusual ideas. The development of new technology that will allow us to save the planet and feed the hungry requires two things: creative thinking and technical skill. Learning these skills should be the priority in our schools, not learning how to give the right answers on standardized tests. So, what does this all have to do with spirituality? Everything. Unless we can be who we truly are, develop and experience the talents we bring to this earth, and share our talents with humanity, we cannot truly be whole. Fuller was often ignored during his life and suffered many setbacks, but he always stayed true to who he was. If we are to experience wholeness, we must not only heal the limitations in ourselves, but also heal what is wrong with our society. We must learn to respect the diversity in each other, not just ethnically, but mentally as well. Because, if we can learn to accept more diversity and new ideas, we may discover the geniuses who will save our world. Related Articles: Happy Birthday, Buckminster Fuller, Interview with Buckminster Fuller (video), (PLEASE READ THIS – Are We Failing Our Geniuses? This entry was posted in Inspirational Posts and tagged Buckminster Fuller, Creativity, Genius, Honoring Intelligence, Inspirational, Passion, Spiritual Journey, Wholeness. Bookmark the permalink. i think you are distorting Fuller ideas because he never talked about wholness. He may not have used the word wholeness, but he always looked at how everything was connected. When he designed the domes, he considered the environment of earth and was influenced by geometry and astronomy. He was also always concerned with how humanity and environment were related and he wanted to create harmony among the related elements with which he worked. Yes, but he also said in the end of critical path that mysticism is not going to solve our problems, he never used the word spirituality. I sent another comment before the last did you get it. I only post comments that do not require me to correct numerous misspelled words and where the structure of the sentences is clear.